Damp within the house is not to be taken lightly. For a start it can be tricky to diagnose the exact cause, then you need to tackle the root of the problem. Simply treating the symptoms is only going to mask the issue at best. Dampness is not a problem that should be neglected; it spreads and slowly deteriorates everything it works through. If your walls are showing signs of moisture or staining, rising damp is the likely culprit. It occurs if water rises up from the ground and travels up through the wall material. Water soaks its way through the brick/masonry pores as far as gravity allows (usually around 1.2m). The build-up of moisture within the wall also transfers into adjoining plastering and leaves visible salt deposits. How Can I Be Sure I Have Rising Damp? Tide mark staining, usually yellow or brown hints coming up from the skirting boards. If you’re having damp problems that don’t match up to these traits it is likely coming from the roof/loft. If damp patches appear over 1.2m up and are not evenly spaced, you will need to investigate elsewhere. What Are The Causes Of Rising Damp? Locate your wall’s damp proof course (DPC). You should be able locate this layer in the wall from the outside of your property. It should run along your walls horizontally, approximately 6” from ground level. It forms a vital physical barrier and prevents water from rising through your wall. Your house may not have one, if so this is the primary cause. Check for bridging. Anything that comes into contact with the wall at a higher level than the DPC can form a bridge. This allows water to bypass the DPC and eventually infiltrate the house. Check ground level is not above the DPC and consider external structures such as stairs. Check Your Neighbour’s home. If your house is attached in any way they may have caused bridging that’s affecting your home. Check their DPC is present, above ground level and not higher than yours or bypassed by external structures. Consider Internal Bridging. It’s possible for bridges to occur within a wall cavity. It is often caused by trapped debris from the initial construction. If significant enough to allow moisture to wick through and bypass the DPC you have a problem. If you’re feeling overwhelmed or simply need expert advice, get into contact with a damp specialist by posting your job on Rated People. A damp survey cost is going to be low or even free of charge, yet it can provide you with invaluable guidance on how to proceed. Be sure to ask how much for a damp proof course and gather at least three separate quotes for installation. Many of the solutions to rising damp are highly suitable for DIY projects if you want to save money. However for bigger buildings or complications, it’s well worth paying to get the job done properly. If you do not have a DPC you will need to retrofit one. Fortunately, there are a number of options available that will be discussed further on. If your ground level is above the DPC you will need to dig it out. Remember, a functional DPC must be 6” above the ground level. Otherwise, you can dig a trench around the external walls to reduce the ground level. Ensure water isn’t going to gather and rise above the DPC. If you have an external bridge you will need to adjust it. Consider removing or simply adjusting any structures that may be causing a bridging effect. If you can’t remove it you can install another DPC at a higher level. If you suspect bridging within your cavity wall you will need to inspect it. You can carefully check within your wall by removing 1-2 external bricks. Do not remove more without first consulting a building surveyor. If it’s full of debris you can try removing it by hand and with a vacuum cleaner. Do not proceed with this yourself if you do not feel confident. Over the years construction practices have changed, as has the DPCs used in our homes. Initially, many homes used slate tiles, yet with modern plastic damp course the cost is far lower, it has become the new standard. Stainless steel is also used in many modern construction projects. These DPCs are great for initial construction, yet as homeowners we have to consider what’s available for retrofit. Below are the most common options you will come across when searching for home DPC installations. – Water Repelling Chemicals: Different forms of cream gel or pastes that are injected into the wall by hand. – Pore blocking salt mixtures: A cement-based mortar that can be fed into walls using a machine pump. – Osmotic water repellent: Wires are imbedded directly into the wall then actively or passively repel water infiltration. Hands down the most cost effective, reliable and DIY friendly option is using cream/gel based chemical injections. Now let’s look at this method in more detail. There is a number of high quality chemical DPCs available on the market. They are easy to work with and provide great results when installed correctly. Previously, even the professionals would struggle to provide great results with other “messier” methods. However, this system only requires disposable cartridges that fit into a standard skeleton gun. They are ideal for retrofit DIY, installation is as simple as drilling holes and filling them. Each hole can be knocked out in 2 minutes or less. Better yet the chemical used is of low hazard to health and spills/stains are minimised during the installation. It’s certainly worth choosing a quality chemical DPC if you want to ensure good results, follow their instructions to the letter. For example Dryzone Damp Proofing Injection Cream has been officially approved by the BBA, this means it’s passed extensive testing as a building material. What Do I Need To Install A Damp Proof Course? Get FREE Damp Proofing Quotes Today! How Much Does A Damp Proof Course Cost? Dryzone cartridges (310ml) can be purchased for around £20 each but you may be able to get 5 for under £100. For larger projects and thicker walls, you can get 600ml cartridges for around £35 each or 3 for under £100. First bear in mind you may have to get your hands dirty with re-plastering. Not just to finish the wall, all existing plastering that has been damp damaged will need removing. If this is the first DPC to be fitted, remember it must be installed 6” above the ground level at a bare minimum. This is defined by British Standards and stated in UK Building Regulations. Drill holes of 12mm diameter with 115mm intervals. These need to reach the mortar course and can be angled down through the brickwork to reach it. Remember, this DPC must be at least 6” above the ground level. Remove any debris or dust from the holes using a vacuum or blower. Connect the nozzle to your chemical DPC cartridge then load it into the skeleton gun. Push the nozzle down into the hole and retract slowly as you inject the cream. Finish when the hole is completely filled. Cap each hole with either plastic plugs or mortar. How Much Does Damp Proofing Cost From Tradesman? Rising damp treatment costs depend on the scale of your problem, the root cause and size of the building. Below is a guide on the average cost of damp proofing for the UK. Expect these prices to inflate by around 20% around London. If you wish them to lay concrete paving slabs in place expect the prices to double. This covers the average costs of damp proofing and DPC installation, but severe damp damage will require additional funds for re-plastering and decorating. It’s easy to simply clean up the signs of damp with a wipe and a lick of paint. Yet masking a damp problem will not stop the spread. Moisture will continue to travel through brick, plaster and wood, damaging the materials in the process. If neglected the problem will worse and end up costing you far more in the long run. 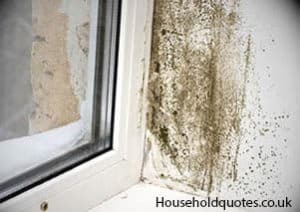 Lastly damp leads to the growth of harmful moulds than can damage our lungs. If you believe you have a damp problem and are unsure on how severe it is, you should consider contacting trusted damp specialists to advise you. Get Your FREE Damp Proofing Quotes NOW!